Setup Your Home Office The Right Way - First Time. Are you setting up a business at home? You're going to need a proper home office. Why? Simply because you're going to be spending a lot of your day there and it's really important to plan your working environment and design a home office that works for you and with you. There is nothing worse than working in an office that you hate. You probably had to work in a crummy office in your 9 - 5 but why put yourself through it when you can design your own perfect work space? Your home office space should be truly all about YOU. It can be whatever you can imagine. Simply putting a desk and a chair in the corner of a room and planting yourself in front of a computer isn't any way to work. If you're going to take your own business seriously then you need to take your home office seriously too - especially if you might have clients visiting your office at any stage. There are several really important ingredients for the ideal home office and this site is dedicated to providing you with the information, services and tips you need to successfully create a useful and comfortable office at home. You'll also find information on the latest technology, gadgets and supplies that are either essential or may just come in handy in your working day. Most people setting up their first home office take very little time to consider the fact that how they plan and setup their office might affect their business. 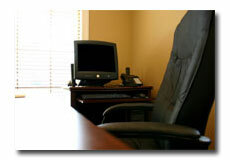 Setting up a home office is not something to be taken lightly or just taken for granted. It's your business premises and needs to be designed and laid out professionally - regardless of whether or not people will actually visit it. You're going to be working in this environment for several hours each day so make it the best it can be. Above all, your office workspace absolutely needs to be comfortable, accessible and practical. Whether you have an entire room for your office or just a small corner of the house or basement the information and advice on this site is going to be useful to you and hopefully save you a lot of time, money and effort in setting up your office at home. You'll find dedicated and specific information on office chairs, computer desks for a home office, computer systems and peripherals, office ergonomics, office design and decoration, software tips and reviews and lots of other home office design ideas. Over time I envision this site becoming the home office guide that you'll enjoy using and sharing with your friends.